Home News Everyone Cannot Stop Gushing Over Deepika Padukone As Padmavati! 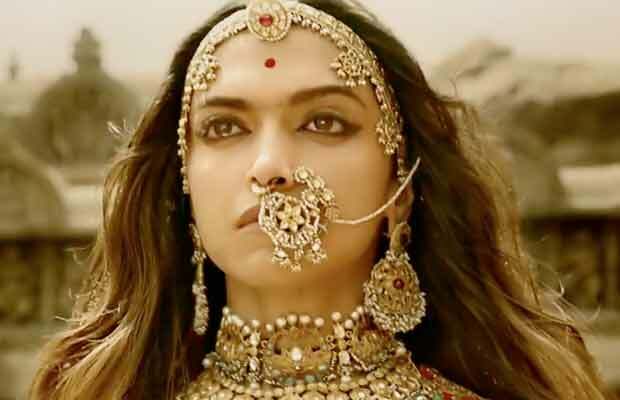 The B-town could not get enough of the royal avatar of Deepika Padukone as Padmavati. The royal Rajputani queen Padmavati aka Deepika Padukone is slaying with her elegant looks and regal persona in the trailer and first song from Padmavati. Deepika as Padmavati hosted the most lavish party at her SoBo Central residence to celebrate the success of her upcoming film Padmavati. The entire B-town attended the star studded party. Interestingly the party prone to gossips only discussed the film, wherein everyone couldn’t stop gushing over the gorgeous host Deepika Padukone as Padmavati. Celebrations galore for the gorgeous actress owing to the tremendous love and response the audience has been showering her with for her portrayal of Padmavati and the graceful Ghoomar. To celebrate all the love coming her way, the actress hosted a party for the who’s who of Bollywood. The impromptu party witnessed a barrage of BTown folks dressed in their best. One of the firsts to arrive at the venue was Deepika’s Padmavati co-star Ranveer Singh. Also in attendance were Shah Rukh Khan, Ranveer Singh, Karan Johar, Alia Bhatt, Kriti Sanon, Gauri Khan, Manish Malhotra, Jhanvi Kapoor, Sara Ali Khan, Ishaan Khattar, Sonakshi Sinha, Abhishek Bachchan, Athiya Shetty, Ritesh Sidhwani, Zoya Akhtar, Imran Khan along with his wife to name a few. From Bollywood veterans to budding actors and stars in the making, the party had the bigwigs of Bollywood attending to Deepika’s impromptu call for celebration. Deepika who will next be seen enchanting her audience as Rani Padmini, has received a thumbs up from the masses for her look and enactment of the Goddess Queen. The actress has been flooded with appreciation for her effortless performance of Ghoomar. The song that has garnered more than 30 million views, has social media in a tizzy with the masses sending in their versions of Deepika’s Ghoomar dance. The release of Deepika Padukone starrer Padmavati is yet about three to four weeks away, but our onscreen Padmavati throws an impromptu party already to celebrate the response that she has been receiving. This is the kind of response which is expected after the release of a film but for this film, all that response and more has come to Deepika already. The actress is not just looking the part playing the most beautiful woman, but even nailing every frame with her talent. Watch Video: Tiger Shroff Reacts On His New Look From Baaghi 2! Previous articleBigg Boss 11: Shilpa Shinde’s Friend REVEALS The Truth On Her Viral MMS Picture! Next articleBigg Boss 11: Shilpa Shinde’s Ex-Boyfriend Romit Raj And Vikas Gupta’s Ex-Boyfriend Parth Samthaan To Enter The House?